The Second Annual Conscious Business Holiday Giveaway launches Wednesday, December 17th at 9am PT. Drawings will be held Jan. 8. We request your winners names be sent to me at juliastege@gmail.com by January 9 at 12pm PT. Winners notice will be sent out from Magical Marketing on January 12. You can feel free to notify your winners separately along with any special instructions you have for them as soon as you choose your winners. Each of you will receive a special infusionsoft link so we can track your opt ins. Please use your affiliate link. The page with the giveaways is FYI only. Please do not share this link with anyone. We do not want folks opting in to your giveaway without opting in to the whole giveaway. PLEASE also do not promote the direct link to your giveaway page on your site or in your marketing. Again, we want folks to go to the main giveaway page. PLEASE look over the pages and let me know if any changes need to be made to your description. We want everything correct when the giveaway opens. facebook.com/holidaygiveaway And then comment about your giveaways or holidays in general. If there is anything else you need, please contact me. OPENING DAY ANNOUNCEMENT (Please send December 17 or as close to December 17 as possible — NOT before! Subject line option #1: Biggest Services Giveaway of the Season! Subject line option #2: They’re GIVING Away Valuable Services! My colleague Julia Stege has really done something magical now! She has put together a sparkling event in which 6 generous conscious entrepreneurs — including me! — are giving away more than $10,000 of high-touch personal business services to make your 2015 the best ever. And it starts today! The 2nd Annual Conscious Business Holiday Giveaway is like NO OTHER giveaway you will see this season. It is NOT a giveaway of “how to” reports that you may never read. It’s NOT a pre-recorded class from 4 years ago that you’ll never listen to anyway. It’s NOT a bunch of hype intended to get you to buy something. Instead, winners will receive actual high-touch in-person services designed to support you to really get to a new level with your business and your life in 2015. Head on over now and enter to win, so you don’t miss it. Don’t wait for Santa to give you want you want this season. Six generous conscious entrepreneurs have put together over $10,000 in high-touch services to GIVE AWAY this holiday season. Instead of receiving old, stale downloads that will gather dust on your computer, our generous contributors are giving away their valuable time to help you LIVE! What’s in the giveaway? First, Julia Stege, the Magical Marketer, is giving away a HUGE grand prize of a Custom Designed Logo! This alone is valued at $3,500! I’m giving away xxxxxxxxxxx valued at $X each and there are thousands of $$ of other prizes. Head on over now to register for your chance to win! If Santa didn’t give you want you want this season, never fear. Six generous conscious entrepreneurs have put together over $10,000 in high-touch services to GIVE AWAY this holiday season and you could still win. Head on over now to register for your channce to win! Subject line: Last Chance for FREE Biz Services! 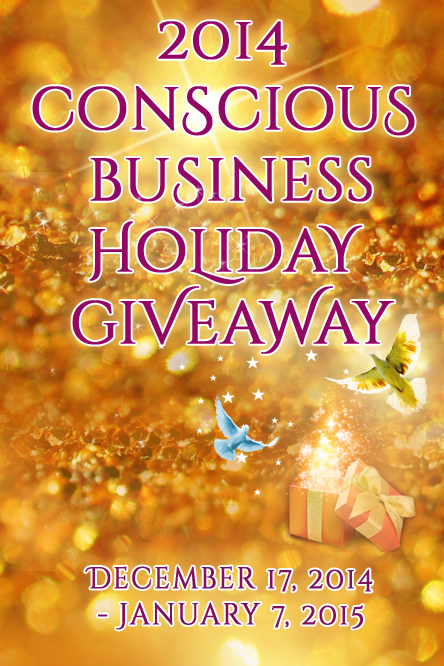 The Conscious Business Holiday Giveaway ends tomorrow January 7th! And I don’t want you to miss your opportunity for [your offer xxxxx] and all the other great services that I and 5 other generous conscious biz owners are GIVING AWAY. These giveaways are incredibly valuable PRIVATE SERVICES… not some download that will gather dust on your computer. There is even a logo being given away, along with private coaching, VIP Days, and other valuable services. If you haven’t already registered for your giveaways — don’t wait another minute! Hundreds of people have already done so; now it’s time to get yours. time, so check it out before it’s too late! NOTE: For FB posts, you can go a little longer and describe what you will be giving away. Best to get a bit.ly link for your affiliate link.